This week Kenny and his team have created a delightful Tea Shop Layout Pack. This pack has eight different pages included to bring any online tea shop to the next level. The pages are stunning with useful sections strategically placed throughout to effectively market your products. These sections include features like seasonal items, new arrivals, tea subscriptions, and more. It even has a unique guide page perfect for instructional videos. This Tea Shop layout pack will definitely take any online tea shop to the next level. The design is refreshingly clean with a modern use of subtle textured backgrounds coupled with a classic font that gives the site a prestigious feel. And the photography is absolutely delightful, bringing the user almost close enough to smell the aroma. To access your new layout, simply activate the Visual Builder when editing a page and look for the “Load From Library” icon in the page settings bar (it looks like a plus symbol). Click this icon to launch the Load From Library popup. Under the Premade Layouts tab, you can easily find the new layout by scrolling through the list of layout packs. Once you find the Tea Shop Layout Pack, click on it. You will see all the individual layouts included in the pack. Select the layout you want for to use and then click the “Use This Layout” button. 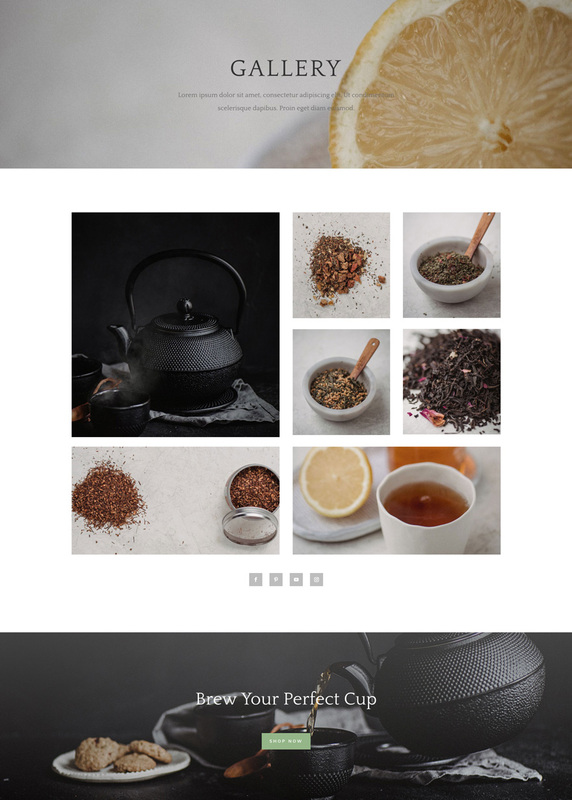 We hope you enjoy this Tea Shop Layout Pack. And to help ensure that you do, we’ll be doing a live stream on our Facebook page this Tuesday at 3pm EST to walk through how to use this layout pack to create something practical for your own website. But a thought: A lot of my clients prefer more compact designs, as opposed to the styles y’all keep making (beautiful as they are). How about mixing up the designs a little? I totally agree. The layouts ET makes are beautiful, but aside from the pictures, they’re all beginning to look and feel the same. Going for some new and unique layouts soon. But a thought: A lot of my clients prefer drinking champagne! Nice idea. With some plugins you can get some great designs though. Great idea! I also have a suggestion, there could be a list of future layouts to be published and people could vote on them and suggest new so the most voted would be published first, that would reveal the real demand. Please release a design for hotel website. We have been anticipating it. Ubaka, have you been doing research online to get ideas for Hotel website designs? I would start there. I’m a huge fan of Pinterest so that’s where I find inspiration. Change the images of that template to a hotel or the images from any other ET Theme to one from a hotel and you have your hotel design. All those ET Themes are nice Eye catcher but have no serious functionality involved as plugins are not being used. And in their tutorials for plugins they mostly use costly plugins which is a pity as so many GPL conform plugins are out there with the same functionalities often even with better functions. In one of the former templates a review got integrated by installing the plugin – but no styling was given – sadly. But tell me – do you really want to drown in beauty? How far apart from real agency life are you actually moving? Our customers are craftsmen from all kinds of areas, such as roofers, tilers, painters, plumbers, heating engineers, hairdressers .. Also, car dealerships, hotels, small restaurants, as well as family businesses of all kinds. There are certainly thousands, but only two tea shops in the 50 km radius. Potteries or yoga studios. Finally, think for the masses and not only for your design ego, where you deliver templates with noble pictures. Because we ordinary people buy your DIVI-THEME, not the intellectual from next door. Nevertheless, I respect what DIVI has been doing to innovate in recent months. I’d love to help some musicians, but they generally don’t have much money. If I had a pre-made layout I could probably help them on a small budget. I was sure I saw somewhere that these wonderful layouts should be available via the Divi Library now, but when I was working on a client’s site over the weekend I did not see any of them in the dropdown/selector lists. How do we find and load them to use them without downloading from here and uploading to our sites? Oops…missed the paragraph about this at the end of the article. s for those knocking you for your design, I have to say that I could use this for a LOT of sites, and it’s not hard to visualize it being used for a number of different business types. If your lovely tea house images were replaced with pix of construction, tools, whatever, it would just look like a nice layout for whatever industry and wouldn’t be “drowning in beauty.” It wouldn’t take much to customize it with client’s photos and transform it into whatever it needs to be. But then I’m not expecting “plug & play” layouts for FREE, just great design that I can customize for my clients to save time while still delivering an attractive, high-quality website. If I needed something other than the layout page at the ET website to show a potential client, I’d take the time to do a little pre-customization so it looked a bit more suited for their specific industry. I can do that because I don’t have to put the time into creating the layout itself and it’s FREE! I used a great interior design layout with a few modifications for an artist website with tremendous success. 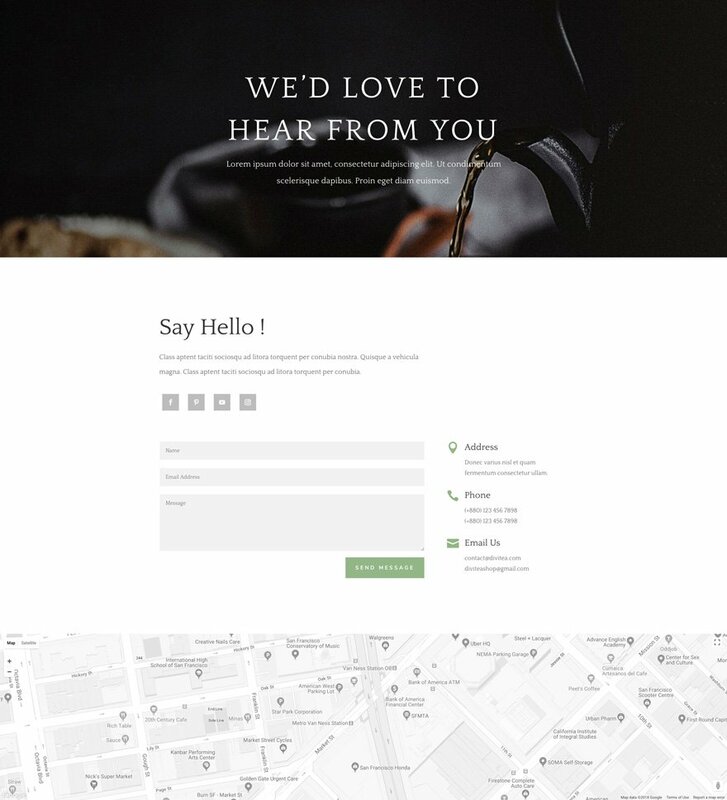 You can see it here: https://www.catherineanderson.net/ Personally I wouldn’t dream of criticizing you for making beautiful layouts available to your customers – even through the Divi interface for max convenience – for free. I would just like to thank you because you make my work so much easier! +1. That is the way monday free layout works. Get inspiration, mow, pull and tweak it to recreate something cool for your client. I’d love to tweak this for a cycling marathon site as you can see. Thanks ET for this cute layout, more creative juice. Ciao! Beautiful. Could you make a layout for DIY fans? Colorful pages for crafters, maybe a fabric shop? Or any other profession, that is potential customer of web designer. You have already done good job doing layouts for software and agencies, but unfortunately they can mostly do websites themselves. Fantastic job, but… when a civil construction layout pack?. Thank you very much for this beautiful layout pack. I agree with everyone here. You guys are great but it is almost like rinse and repeat. A little change up would be greatly appreciated. But give us shopping cart layout guys. Give the layout for free but charge us money for the WooCommerce shopping cart layout. YES YES YES !! Cart layouts, I don’t care what it costs, I’ll buy it. Holy smokes… I’m reading all the comments about template suggestions. I have to smile because this is what happens when the ET crew spoils us … Everyone just wants more! 😉 If you are waiting for a certain type of layout, why not find a website you like online and then figure out how to build it using the original as a “blueprint”. Isn’t there a third party divi theme builder creating these other “blue collar” type business templates? Hi Janet, I agree with you, but ET are going to do some more layouts, why not give them customer feedback and point them in the right direction? 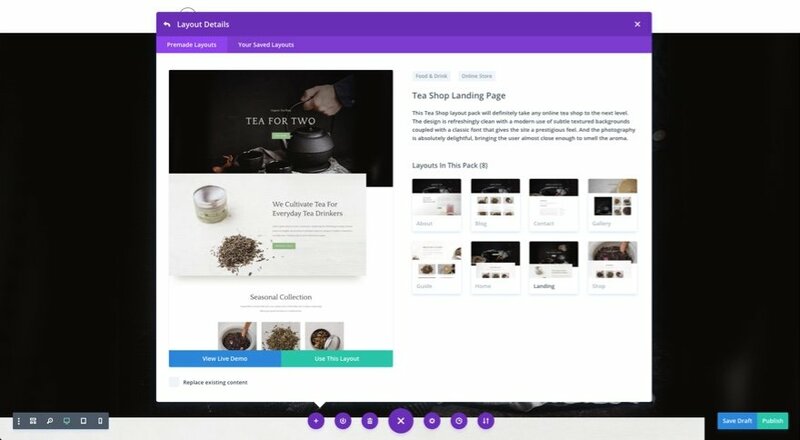 The Layout library will then contain a very useful diversity of designs to help customers with imagination and prove that anything is possible with Divi. I read the other comments and I am sure all are sincere and with love to Divi and ET, people comment because they really care, if they did not, they would not waste their time. This is proof that in 10 years of existence, ET created a community that cares, congrats ET. If folk want stuff, they need to go build it. If you want pre-packaged templates, then make your clients pay for an out-of-the-box template from Themeforest. The whole point of the Divi theme is that you have the freedom to dream and imagine any layout you want. Like something you see? Recreate it. Doesn’t exist yet? Build it. Want a feature? Hire a developer. The ET team sees everyone’s feedback, thousands of designers and developers all over the world. They’re rolling out the features and layouts at the right time for the best number of people. Check out Elegant Marketplace for the kinds of boilerplate business stuff you’re looking for. ET has always played in the ‘creative sandbox’ for layouts. Janet’s right – we’re hugely spoiled. I’m so impressed that the ET team is actually giving away these crazy awesome layouts, and not setting up their own child theme store. They’d be well worth it. I generally agree with you – ET has taken this platform to a whole new level, and the fact that they’ve hired designers to create these layout packs is the very definition of “value added”! That said, I’ve only once used these layout packs for their intended use. Rather, I use them for inspiration. And the fact is that the designs have gotten repetitive. It’s not something to throw a tantrum about – at all. But I think it’s fair to give some customer feedback. The overall sentiment seems to be that the design team try some new styles. I think you can politely ask for that without coming off as demanding or spoiled. Divi (and ET) are the best value out there! Thanks Janet, totally agree. It seems to me that so many who are chiming in for better templates are basically misunderstanding their roles as developers. If you are hired to build a website for a client, and you’re expecting all the design work to be done for you, for free, you’re not a developer, you’re a hack that’s charging too much money for what you’re delivering. News flash, if you expect ET to take care of your design work for you, you’re not doing it right. The entitlement of people these days is astounding. No one wants to work or learn how to do anything, they just want everything handed to them so they can fill in the blanks. The source of this, I’m guessing, is that people think they can bill for design work, but then just use a canned template and then keep the money that should have gone to a graphic designer, for themselves. Essentially, outsourcing the design work to ET but never compensating ET and not giving them credit for the actual work. I do not want to be annoying but … I feel that the designs are more of the same lately, I appreciate the effort, and the help they always give us, but the designs are far from fitting in the majority of clients, we need designs from construction companies, sports teams, restaurants, dentists, clinics, ecommerce, business designs in general. I would prefer a good design every 2 or 3 weeks, than one every week that is more of the same. 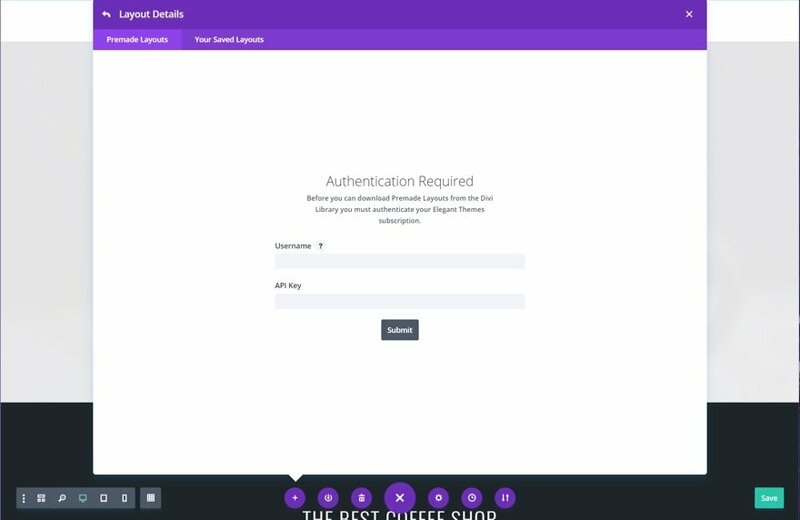 I also get ideas as a design contest for the community and that the winner receives something from you and the design is to be used in divi, it would really be annoying to have the builder full of designs that he will never use or almost never, thanks for his effort and listen to customers. Condivide, all styles design are soft and very beautiful, but it’s all same style. We would like more design like restaurant, hotel, sport, fitness and more. Our costumers are business companies and not tearoom or some like that. But you work it’s very important end exclusive and help us for understand size, color, font and make new composition. Thanks for all. All designs are gorgeous as is this Tea Shop. I mean really gorgeous. What I particularly like is the animated transitions in all of the designs. The transitions are smooth, elegant and definitely have the wow factor. Please can you consider designing something different to put into the mix. Different styles, and how about some of the beautiful how to’s (animation effects with images that have been featured on the blog in tutorials. How about putting those into some designs with variations. I definitely dig this design! I love the fact that you guys are hitting all the industries. This design initiative movement is such a game changer! Well I have to echo what everyone else is saying here. Where’s the outside the box stuff? Divi is capable of far more. It’s almost as if there are already many layouts in the can and they are being released regardless of what the community thinks. I want to get excited when I see a new layout is available. I want to. Instead I see it and immediately my mind says oh this is just like the last several layouts. I suppose if I were in the minority then it wouldn’t be as frustrating. But when all of the comments are saying the same thing it should count for something. We all love Divi. ET are you listening? Both are phenomenal examples of outside the box creative design. Where are those layouts you mentioned? Wow, great design as always. Thank you for sharing! Hi, a request, one of the first your demos will never be downloaded. Name is Fashion theme, theme with brown and cream dark color and style more elegant. I find them very complete and important for the structures and colors. Thanks for your beautiful work, it’s important for learn color, font, dimension, and new style. I would like see for european business, more theme complete like that. And theme for restaurant with more fantasy and creativity. Thank a lot from Italy. Lovely looking layout and I applaud the free content and work that goes into these layouts… BUT ….. it is all looking the same. Try something with a bit more detail and content per page. A community site or something that needs more than a big slider/header, 3 small pics, overlapping images and a shed load of white space etc etc. And please please, place put the preset layouts on the other (non default) tab when loading layouts – these are not the first things I want to see every time I go to load a layout. Please add one layout specially designed for drop shipping website. I plan to make drop shipping website using divi theme or please suggest any better way from available resources of elegant themes. Hi! I am trying to download the layout but I do not succeed, I can only download the full res images. How can I do it to finally have it the package ready to be used? Thank you!